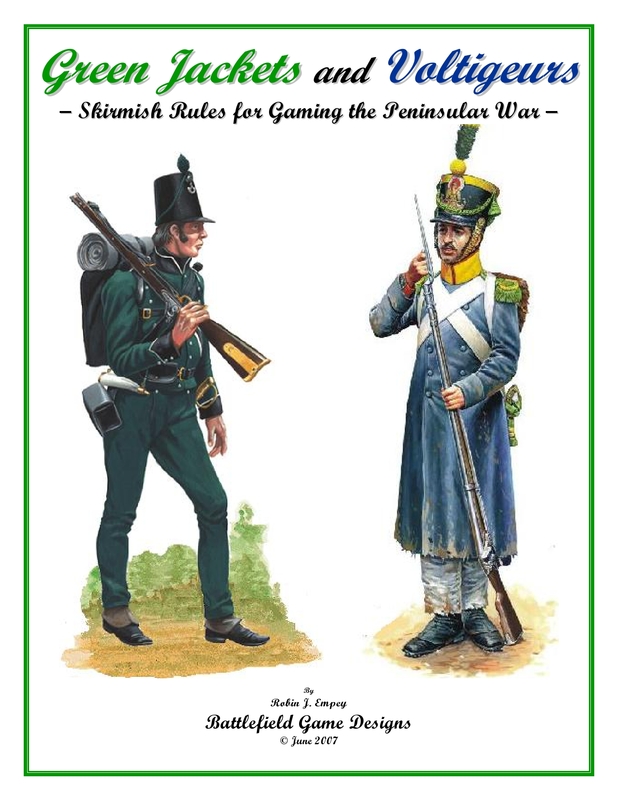 Green Jackets and Voltigeurs is the flagship miniature game rule set created by Battlefield Game Designs. Initially released in 2002, Green Jackets and Voltigeurs is celebrating its 10th anniversary with a fresh new look and more comprehensive rule system. This game has been developed as a fast-paced, fun and exciting method of playing Napoleonic Skirmish Games set in the Peninsular War. The rules are easy to play, allowing the War Gamer the creativity in designing or modifying the rules to their own standards utilizing their own scenarios or using the numerous scenarios included based loosely on many historical skirmishes and some fictionalized accounts throughout Portugal and Spain. The game uses a random card generating system, in which each miniature figure is matched to a game card shuffled into the card deck. Figures are assigned a random number of Action Points each turn based on a 1d6 die roll at the start of each round so their action abilities also change each turn. $85 (US) + shipping at cost for limited edition copies signed by my good friend, Jason Salkey, aka “Rifleman Harris” from the BBC Sharpe movie series. Also included is a photo of Jason signing your copy. This entry was posted in miniature games, rule sets, Uncategorized and tagged 1807, 1807-1814, 1814, 19th century, 19th century Portugual, 19th century spain, Arthur Wellsley, Bonaparte, British army, Duke of Wellington, Empey, France, French army, great Britain, Guerilla, Guerilla war, Guerilla war fare, Guerrilla, Guerrilla war, Iberian Peninsula, miniature rule sets, miniature rules, miniature war gaming, Napoleon, Napoleon Bonaparte, Napoleonic miniatures, napoleonic rule set, Napoleonic rule sets, Napoleonic War, Peninsular War, Portugual, Portuguese Army, Robin Empey, rule sets, rules set, rules sets, Sir Arthur Wellesley, skirmish, skirmish game, Spain, Spanish army, Spanish Guerillas, Spanish Guerrillas, squirmish game, The Miniatures Page, TMP, war fare, Wellington. Bookmark the permalink.